The following message was delivered at Trailhead Christian Fellowship Church on 8/13/17. Post-traumatic Stress Disorder; Reactive Attachment Disorder of early childhood or infancy; Attention Deficit/Hyperactivity Disorder-Combined Type; Anxiety Disorder; Major Depressive Disorder, Recurrent; Neglect of Child; Sexual Abuse of Child; Asperger’s; Mood Disorder; Problem with Primary Support Group; Bipolar; and, Fetal Alcohol Syndrome. Quite a list, isn’t it? But, behind each of these labels is a child. Just as each of us would not desire to be known as any of the labels that apply to us and our “problems,” these children deserve to be known for something other than their present difficulties or their troubled past. This is something I am mindful of as I work with the children on a weekly basis at Intermountain’s Residential Services in Helena. There is a unique balance that that I seek to achieve when communicating the truths of God’s Word through chapel services and activities. That balance is between my knowledge of our children’s past and present difficulties and the hope you want to cast for their future. Emphasize the pain of the past too much, and you risk losing the beauty of the gospel to overcome every obstacle this world sets in our way. Emphasize the promises of God and the “good news” too much and a traumatized child who is trapped in her shame is likely to either stuff their grief and loss and pretend everything is OK, or act out in a way so as to reject Jesus as someone that couldn’t possibly love her. The good news seems simply TOO good to believe. In Montana, where 17% of our children have experienced three or more ACEs—adverse childhood experiences like the incarceration of a family member, a caregiver with a substance abuse problem or a mental health diagnosis, neglect, and so on—this is NOT an issue only for me, a chaplain at a residential treatment facility for severely emotionally disturbed children. We have around 220,000 children in Montana. 17% of 220,000 is 37,400. That’s roughly the size of Helena… 37,400 children that before age 18 have had to deal with multiple significant and major stressors in their lives, robbing them of their childhood innocence and wonder and thrusting them face first into the worst this world can conjure up. At any one time, I have 32 children I minister to. That’s our limit. Less than 1/10th of one percent of the children in Montana deeply affected by adversity. Let me ask you… where are the rest of these children? No, I suspect this dynamic is more at play in our churches with children and adults than we might realize. We have a significant population of children experiencing adversity, and adults trying to overcome past trauma and abuse. The cycle continues, and we’ve all been called to do something about it… and we can start with our children. This Sunday, I want to focus our attention the gift children are to us. Children are close to the heart of God and a treasure to us in the church. The opportunity a church has to make a lasting impression on a child is profound. Indeed, for most of us, our favorite memories of church can be associated with children, or are perhaps from our own childhood? The energy that children bring, while sometimes overwhelming, is also joyful and life-giving. Children remind us of our legacy that we are leaving as a church, of the great privilege entrusted to us to lead and guide them in the faith. Children fill our imaginations with color and light and hope. Children embody the dreams we have for a better future. My childhood, though far from ideal, was radically shaped by the positive influence of being a part of a faith community. A favorite image of mine from childhood is that of the children gathered around Jesus that was in the children’s Bible I received at my baptism in 1980. It’s a pretty popular image of Jesus and the children, and I am guessing you have seen it, or one very much like it. 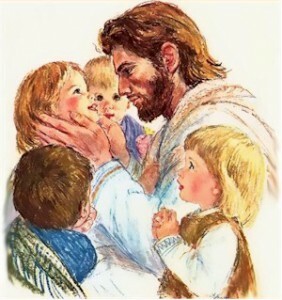 There is something very tender about the way Jesus cradles the face of the little girl in his hands as well as the nearness of the other children to the Savior. A large print of this picture still hangs outside the pastor’s office in the church of my youth… Pilgrim Lutheran Church in Puyallup, Washington. I know, because I was there a few months ago. It’s a beautiful picture and one that takes me back to my childhood. There is, however, something amiss in this picture… at least for me and for what I know both about Jesus… AND the children he loves so dearly. Can you guess what I find troubling about the picture today? In the picture everyone looks so clean… not just physically, but spiritually and emotionally as well. They don’t look like the sad, shameful, frightened, and angry children I see in my work. Nope. These kids are the cream of the crop… selected by some Heavenly talent agency for a special photo op with the Savior. How odd that the disciples would have rebuked the lovely children depicted in most pictures and rendering of this encounter… NO… there must have been some reason for the disciple’s rebuke beyond a miscalculation of their leader’s care for children! They had been with Jesus long enough to know that he often spent time and lavished attention on those who others overlooked. Could it be that the children coming to Jesus were not in their “Sunday best,” but were perhaps a little disheveled and poorly behaved? Could you envision them pushing their way through to see Jesus, as eager to wrestle with him as they were to sit attentively and soak in his wisdom? In my twenty years of working with and speaking to children, I have yet to replicate this scene of Jesus with the children. I consider myself a pretty effective communicator with little ones, and still they squirm, would rather talk about their pet dog than the Bible lesson, pick their nose, lift up their pretty dresses… and all manner of things to embarrass their parents sitting in the pews. And as I alluded to earlier, the children I have worked with rarely came as “clean” as these children in the picture appear. The children I have worked with in various church settings, and work with now at Intermountain, may have looked like children on the outside, but had dealt with some very “big person”-type and adult-like problems. Depression, ADHD, reactive-attachment disorder, mistrust as a result of physical or sexual abuse… all these are not uncommon. Children who have been hurt in this way show it by their behaviors—behaviors that would disqualify them from that pristine photo op with the Savior. Can we blame the disciples from wanting to shield the Messiah from the messiness such children bring? Perhaps we can, because our hearts are full of compassion and longing to see all children come to know the One who can ultimately bring them peace, healing, and rest?! However, I wonder if our attitude towards the big problems these little people face is not dissimilar to that of the disciples in the gospel account? This is a hard teaching, but one worth challenging ourselves with: What does it say of our understanding of God’s kingdom if we’d rather work with the well-groomed, well-adjusted, well-behaved child and turn away those that have been hurt by the darkness of this world and are struggling to overcome it? “Let the little children come to me, and do not hinder them…” Jesus said. But what of their hurt, their anger, their aggression, their sadness? It’s all so… messy. Not to mention, difficult. “The kingdom of God belongs to such as these…” Jesus said. Indeed. If not this child—any of the children I work with each day at Intermountain, and those children hurting and in the shadows of your own community—if not these children, than who among us may come?